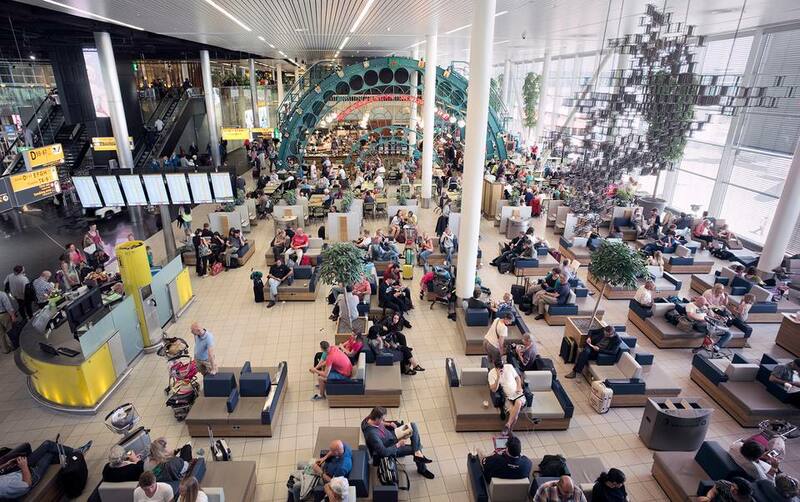 Small, relaxed, little hassle—Rotterdam The Hague Airport (RTM) is a lot like the Netherlands in some respects. The third-busiest of the country's five civilian airports, Rotterdam Airport sees over a million flyers each year, and despite the few airlines that serve it (just nine at last count: Arkefly, BMI Regional, British Airways, CityJet, Jetairfly, Transavia, Turkish Airlines, VLM Airlines, and Vueling), it offers a convenient variety of destinations across Europe, plus a few others in Morocco and Turkey. While there are no direct transatlantic routes from North America to Rotterdam Airport, American fliers can sometimes find substantially cheaper fares if they travel first to a major European air hub, then continue with a low-cost carrier to Rotterdam or another smaller Dutch airport. The trip duration to Amsterdam is 1 hour, 20 minutes as opposed to just 15 minutes from Schiphol, but travelers who want to visit Rotterdam and/or use the Netherlands' second city as a base to explore the attractions of South Holland will find it a convenient destination airport. The optimal mode of transport between Rotterdam Airport and Amsterdam is public transport: a local bus to the city's central train station, and then a Dutch Railways (NS) train to Amsterdam. Bus line 33 (direction: Rotterdam Centraal) takes flyers from the airport terminal to Rotterdam Central Station. Tickets can be purchased from the bus driver. Travel time is about 20 minutes. Find the latest bus schedule on the Dutch travel advice site 9292, as well as custom transportation directions from the airport bus stop. From Rotterdam Central Station, there are direct trains to Amsterdam Central Station. The Intercity train (direction: Amsterdam Centraal) takes 1 hour, 10 minutes to reach Amsterdam Central. For the latest train schedules and fare information, see the Dutch Railways (NS) website. Visitors who want to travel only as far as the cities of Rotterdam and The Hague can take bus line 50 from the airport to the Meijersplein metro station, then use the super-efficient RandstadRail (metro line E) to reach their final destination. Is There Shuttle Bus Service Between Rotterdam Airport and Amsterdam? No shuttle bus service exists between Rotterdam Airport and Amsterdam. Instead, use the RandstadRail, local bus and/or Dutch Railways (NS) train as described above. For limited distances, the Rotterdam Airport Taxi may be practicable, but taxis—here as elsewhere in the Netherlands—are costly. The company also offers transportation between Rotterdam and Schiphol Airports. For visitors who need only travel between the airport and Amsterdam, it's best to select another option than a car if possible. Car travel between the Netherlands' two most populated cities is decidedly unnecessary, with all the excellent public transport connections that exist and all the hassles of car use within the cities themselves. Nevertheless, visitors who wish to rent a car for their trip can do so at the airport, where five different companies are stationed in the terminal; contact information for each can be found on the ​Rotterdam Airport website. Detailed directions on how to reach the airport can be found on the ViaMichelin website, where motorists can choose their route of choice and calculate trip costs. The 43-mile (70 km) drive takes about one hour. While opinions are divided about the city of Rotterdam itself, visitors with an interest in Holland beyond the borders of Amsterdam should certainly take the time to become acquainted with the dramatically different vibe of the Netherlands' second most populated city. Moreover, it makes for the most cosmopolitan—if not the most convenient—base for further explorations of the province of South Holland. As for most convenient, that distinction should probably be awarded to Leiden, a major rail hub that feels close to all of Holland at once and perfectly equidistant between Rotterdam and Amsterdam.